Bulk Nails Manufactured to Ensure Efficient, Consistent Performance. Manufactured with the highest quality standards to insure efficient, consistent performance. Since 1966 Garnett Company has been a distributor of machine quality bulk pallet nails guaranteed to run efficiently and consistently in your automated Viking, GBN, or Morgan pallet manufacturing equipment. We represent manufacturers with only the highest quality standards. All nails are manufactured using C1042 wire rod to insure that the nails do not bend and properly penetrate even the hardest dried lumber. All nails are sold in 50 pound boxes with 48 boxes per pallet. Standard lengths of bulk pallet nails can be produced: 1-5/8”, 1-3/4”, 2”, 2-1/4”, 2-1/2” and 3”. 11.5 (.113) and 11 (.120) gauge bulk pallet nails are the most common but nails can also be ordered and produced using 10 (.135) gauge and 12 (.105) wire. Most commonly bulk pallet nails are manufactured with a NP (no point, blunt on the tip) or a BDP (blunt diamond point, with a pointed tip) based on customer preference. 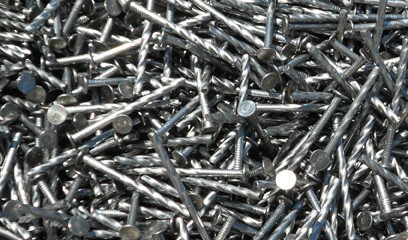 Bulk pallet nails can be screw shank or ring shank. Container deliveries (864 boxes) can consist of one size or a variety of specific sizes tailored to the needs of your unique pallet operation. We also have a warehouse centrally located in southern Missouri for less than container/truck load quantities. Vinyl coated and heat treated nails are also available! Contact us for a quote today!